Britt is finishing his time as a missionary with Global Ministries, and is being stationed by the Methodist Church in Ireland at another congregation in East Belfast. Alison will be continuing in her role as a Global Ministries Missionary – using her counseling gifts at East Belfast Mission. Both of us are grateful to all who have prayed for and supported us these four years, and would be glad for your continuing support for Alison and prayers for our whole family! There are some journeys we undertake without fully knowing our destination. When Jesus called the disciples to follow him, they had no idea what kind of change it would bring to their lives. Would they return to their nets in a week, a month, or a year? What places would they visit? What would they actually do (‘fishing for men’ may not have made much sense)? They could not have imagined the joy, amazement, or pain that they would encounter. They only knew, in that particular moment, that it was right for them to go with Jesus. 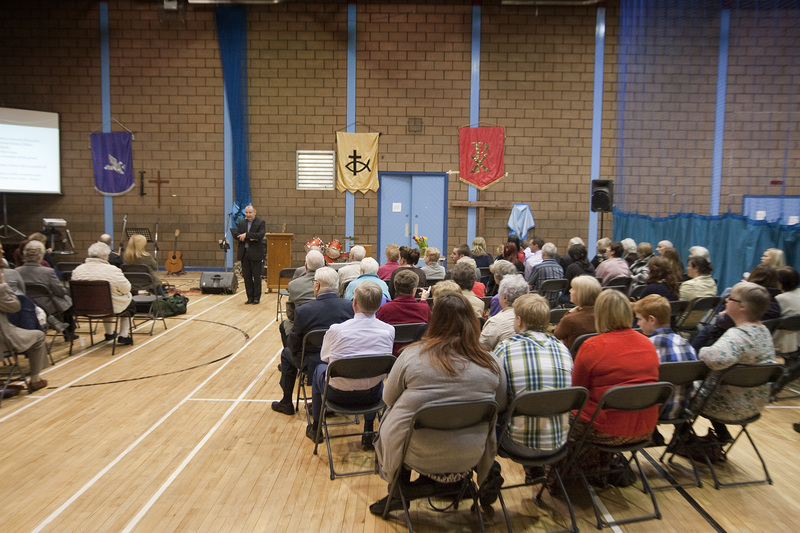 Worship in Connswater Community Centre. Photo by Mike DuBose, UMCom. In the summer of 2011, as we were saying goodbye to friends and family in Orlando, we weren’t sure what it would look like for us to be serving at East Belfast Mission as a family – we only knew that it was right for us to go. I did know something about the place, having previously spent two years with the youth at EBM. Yet we knew that the organization was undergoing tremendous transition, as they were building a large new space with a vision of offering renewal for the surrounding community. For our first eighteen months, therefore, the congregation met in a local community center, and there were plenty of conversations about the move in the midst of normal life of building community, preaching God’s word, and caring for one another. 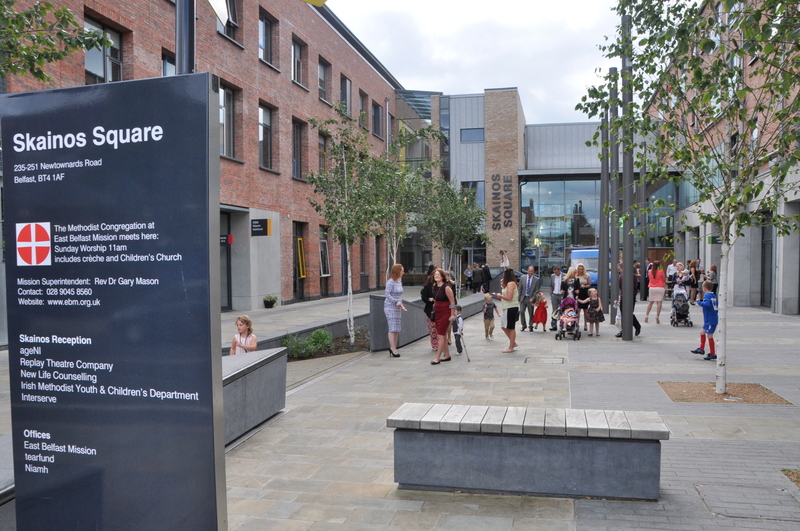 Moving into Skainos, however, was just one of the major changes that EBM has traversed during our time. There have been expanded projects and new staff, so that EBM has nearly twice as many employees as when we arrived four years ago. Last year, the mission welcomed a new Superintendent in Rev. Margaret Ferguson, as Rev. Gary Mason finished his fifteen years leading the organization. In addition, there was a particularly difficult year bridging 2013-14 as a number of key staff were dismissed following a lengthy investigation. Together, these changes have created an atmosphere of constant shifting – and have formed our understanding of God’s call for us as mission partners. Our growing sense of vocation was to offer care, help and peace (as we could in our limited ways!) to the community at and around EBM in such intense times of transition. Though Alison’s role as counselor has been steady, my responsibilities as Associate Minister have varied from year to year depending on the needs of the season. Meeting in our cafe offering encouragement to a young adult trying to stay sober and find a way through a difficult time, or listening and offering prayer with a resident in our hostel. Preparing and leading a Bible study and discussion for long-term members of our congregation. Meeting with and offering support to our homework-club co-ordinator, and then popping by to say hello to the children. Visiting a congregant in the hospital. Writing a grant monitoring report to give feedback to a funder of our social programme for seniors in the community. Hosting and offering a tour to a visiting group from America (GA, FL, MN, WV, etc…), Malawi, Malaysia, Belgium, or Belfast! Getting ready for a community service day. Photo by Mike DuBose, UMCom. These bullet points, however, are just a listing of activities and only mean something when there are representative of caring relationships. One of the things I have enjoyed about EBM is the many people who seek to honor the worth and dignity of each individual – no matter their past or current failures. The clearest organizational value is ‘Everybody Matters’, which is rooted in our Biblical understanding that every person is created in the image of God. Some people who come across the door of the mission may be overlooked by the rest of society, but they matter to God and should matter to us. As Alison and I prayed about the future over this past year, we felt that this summer would mark a turning point. It has felt to us like this season of significant transitions is now drawing near an end, and that EBM would be entering a new season of life. It is difficult to put months of prayer and conversation into a few words, but I felt that this summer would be the right time to say farewell to a place that has shaped me profoundly over two seasons in my life. Having now been stationed by the Methodist Church in Ireland, I will be taking up the role of minister at Knock Methodist Church from 1 July. This church is only located about two miles away from EBM, and yet it will be a very different experience for me compared to the last four years. 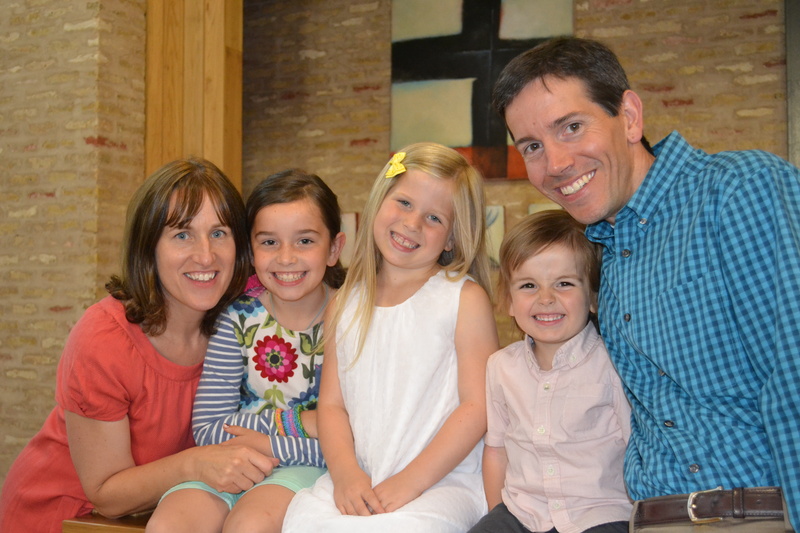 Alison will continue in her current role as GBGM missionary as a mental health counselor at EBM. She has received much positive feedback from her ministry, and (though I’m clearly biased!) I see how she is clearly gifted for this work. Due to the trauma that Northern Ireland has endured in the past, there are many people with severe depression, along with many other mental health challenges that have arisen through a time of such conflict. She offers hope and perspective to people in very difficult places. The counseling service at EBM has been and continues to be in high demand. Alison will be increasing her hours in the upcoming months, and continues to be sent and supported in this work by Global Ministries of the United Methodist Church. Alison’s missionary support code (or Advance number) is 3021321. So we find ourselves on a continuing journey – seeking to follow God with our lives and yet unsure what the next stage will feel like. I am thankful for these past years at EBM, and am conscious that the ministry offered across the world by Global Ministries would not be possible without individuals and congregations who give and pray and support this work. So thank you once more, and may you know God’s blessing and guidance in your own adventures of following Christ today. Great post! We will be praying for you all as you make this transition this summer.